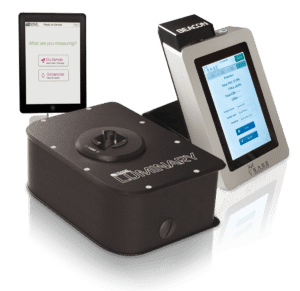 Really, How Does Sage Analytics’ (NIR) Spectrometry Technology Work to Measure Cannabis Potency? What is NIR (near infrared light) spectrometry and how does it work? A beam of light is shined through a small sample of cannabis or extract. Due to the nature of light, some of the light is absorbed by the sample, some scattered forward, and some reflected back. The portion of light not absorbed by the sample is directed to a spectrometer, which measures the spectrum of the resulting light. Think of a spectrum like a rainbow. The remaining intensity of different colors produced by separation of the light according to wavelength tell us the materials that the light is passing through. 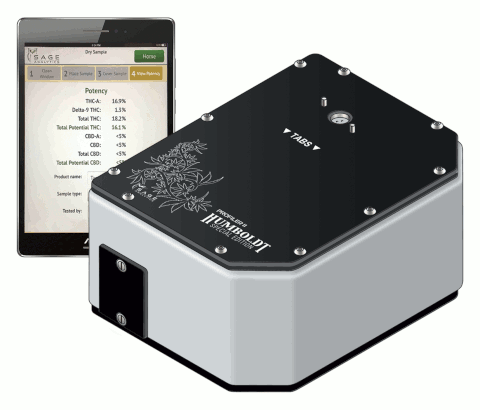 The Sage Analytics Profiler reads the cannabis “rainbow” and allows fast, nondestructive measurement. Another way to look at it is like an inverse finger print. 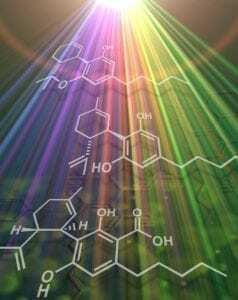 Sage Analytics knows what light is going in and can see how the cannabis absorbs light based on what it’s made of. By reading the light, we have the ability to quantify how much of the four major cannabinoids are in each sample. Why is it better than traditional testing? While chemical analyses of cannabis has long been established, it can take days, even weeks, to complete. The process is also high in labor and material costs. Because samples are destroyed during traditional chemical testing, this limits its applications to small sample-size, one-time measurements. Also, time delay prevents growers from measuring THC levels during cultivation and thus they have no scientific measurement for fluctuation in optimum harvest times for maximum THC levels. Because Sage Analytics uses (NIR) Spectrometry, tests are done with a “scan and read” capability. This seems like science fiction, but it’s been used to make your pharmaceuticals, supplements, cosmetics, and food and beverages for decades. No samples are destroyed and cultivators and labs can get instant results on potency levels. This is important because as a high-value economical crop, cannabis’ valuation is not so much tied to its weight, but its potency.